As the average age of financial advisors creeps higher each year, and grows closer and closer to the traditional age of retirement, a growing chorus of voices have warned of the looming onslaught of advisors retiring, the lack of young talent to take over their firms, and thus a wave of advisory firms that will come up for sale resulting in a competitive a buyer’s market that will make advisors regret having waited to sell. Yet despite what has been portended by demographics, the wave of selling has not come, advisory firm merger-and-acquisition activity has remained relatively flat for years, and if anything the drive for larger firms seeking inorganic growth through acquisitions and tuck-ins has led increasingly towards a seller’s market, despite nearly all predictions to the contrary. Given that industry studies still find the overwhelming majority of advisors have no succession plan (and aren’t taking the steps to create one), it raises the question of whether the entire succession planning crisis may actually be a mirage… for the simple reason that most advisors would be financially better off staying in their practices than selling them anyway, and many find their advisory work a professional vocation so personally fulfilling they wouldn’t want to leave it anyway… especially if the practice can be adjusted to better accommodate their later years’ lifestyle preferences. Thus, while succession planning may remain relevant for a small subset of firms that really wish to pursue such a strategy and are prepared to execute it, perhaps it’s time for the companies that support financial advisors and the industry at large to recognize that the majority of advisors need support for exit and continuity planning, not succession planning. The focus should be on how to redesign a firm into a lifestyle practice, with ways to ensure that clients are well served even if an advisor stays in their practice until the very end, and that an advisor’s spouse or heirs might even receive some “terminal” value to the practice once they are gone (in addition to enjoying the cash flow from the business along the way)… rather than continuing to collectively attempt to “guilt” advisors into leaving a practice that they don’t want to personally or financially let go of anyway! 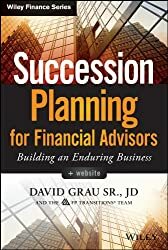 Notably, in this context Grau suggests that a true succession plan is entirely about an internal transition to the next generation of advisors (and owners), which occurs gradually over time, and preserves the integrity of the business as is. When viewed from this perspective, the reality is that there doesn’t appear to be much succession planning occurring in the world of financial advisors. A recent SEI study suggested that only about 1/3rd of advisors even claim to have a succession plan, barely half of those actually have a binding and actionable agreement, and even then it’s not clear at all how many really fit Grau’s definition (versus just planning an outright third-party sale), and more importantly how many will be executed successfully (or at all) when the time comes. Grau estimates from his own experience at FP Transitions that in the end as few as 1% of firms may truly be prepared to effectively execute a real (internal) succession plan. The implied consequence of this dearth of succession planning has been that advisors are “leaving money on the table” and potentially harming their clients who may be left like dust in the wind if the advisor/firm goes away (or alternatively, that clients may be declining to work with advisors who don’t have a succession plan in the first place). Yet at the point the overwhelming majority of advisors still don’t have a succession plan, despite all of the implied downsides, and advisory firm AUM being sold is still at half the level in 2014 that it was in 2007, it raises the question: perhaps succession planning isn’t really perceived to be as valuable as it’s cracked up to be? While industry studies often throw around “typical” advisory firm valuations like 2X revenue, the reality at the end of the day is that a business is ultimately valued based on the estimated cash flows it can provide to its owner – i.e., the profits of the business after all expenses are paid. In point of fact, a 2X revenue multiplier can simply be viewed as shorthand for a valuation of 8X profits with a “typical healthy” 25% profit margin. Although notably, while 8X profits may be viable for a large, established advisory firm, a smaller/solo practice often sells for an amount closer to 3X-5X of profits (which in turn may be paid out over several years in an earn-out provision), which is closer to a multiple of 0.75X to 1.25X revenues! The greater problem for most advisory firms beyond just the fact that they receive lower multiples is that their true “profits” are far less than often realized. For the large number of advisors who are still solo practitioners (or loose silo’ed partnerships), the raw cash flow from an advisory firm can be quite significant and imply their practice could be sold for a hefty amount, but may overstate the true value of the practice because a large portion of the advisor’s cash flows are not actually profits and instead represent the income they generate for being an advisor in the practice. For instance, if an advisor takes home $200,000/year, but it would cost at least $150,000 to find another advisor to do the same job providing financial planning services to the existing clients, then the true profits of the firm would only be $50,000. Which means at an 8X profits multiplier, the practice is not worth $1.6M but a “mere” $400,000, and at a 5X profits multiplier is only worth $250,000. In this context, it suddenly becomes clearer why it is that few advisors are likely seeking out succession plans. If the advisory firm is “just” worth $400,000 (or $250,000, or less), and the advisor is already taking home $200,000/year, then working a “mere” one or two more years generates the same cash flow as selling the practice! Just working two more years! And of course, at the end of the two years, the advisor still owns a practice that might still be worth close to $250,000 – $400,000, and can still keep working and earning that cash flow as well! The end result: unless the advisor can find a successor who not only buys into and takes over the practice over time but can materially grow it along the way as well (which does make the succession planning math look better), the most financially rewarding path is generally not to execute a succession plan and/or to sell the business, but simply to hold on for two more years. And in two more years, the story is essentially the same, the math doesn’t change much, and once again it still makes sense to hold for two more years. Suddenly, the lack of succession planning doesn’t seem so surprisingly; unless it’s sheerly impossible to work, there’s little incentive to do it at all! And furthermore, as a recent CLS study on succession planning found, the majority of advisors are planning on the proceeds from the sale of their practice to cover half of their retirement needs, and the sales price just isn’t enough to meet the goal – at least, not without working several more years anyway! Of course, the fact that continuing to work provides better cash flow doesn’t necessarily mean everyone would/should keep working. For some, they simply don’t need the money, so there’s not much incentive to continue to pursue it. For others, they are tired of the work itself, and would rather wind down the practice than continue to work as hard as they have been. Yet unless the advisor just isn’t mentally/physically capable of the work, the decision doesn’t have to be an all-or-none proposition; the ongoing rise of “lifestyle practices” signifies a happy midpoint. What is a lifestyle practice? Although there’s no formal definition, it’s essentially a characterization of an advisory firm – typically a solo practitioner – who is not necessarily trying to maximize the growth or economic value of the business as an entity, but instead is simply trying to fit the business around his/her lifestyle and maximize the cash flow (to the extent possible) along the way. This might include adopting technology and outsourcing solutions to more easily operate the practice from anywhere (e.g., while spending weeks/months at a time at a second/vacation home), reducing the number of clients to reduce the workload and required time in the office (and/or the required staff to support the practice), and focusing on the “most enjoyable” clients who bring the most personal fulfillment to the advisor. The shift towards lifestyle practices amongst experienced advisors with mature practices shouldn’t be entirely surprising; it’s actually similar to a lot of other professionals, who similarly “die with their boots on” and work as long as they are mentally able (and physically able, though that’s rarely the constraining factor given that advisory work isn’t very physically demanding). Just as there are many experienced doctors and lawyers who continue to work through their 60s, 70s, and sometimes even into their 80s, so too are a lot of financial planners likely to follow a similar path, given both the financial and personal rewards of doing so. Which makes the presumed “succession planning crisis” of the industry look like little more than a mirage, as despite the onslaught of baby boomer advisors reaching the classic age of retirement, the actual number of advisors retiring may be far more limited. Or at least, if the succession planning crisis is going to emerge, it may still be another two decades away. Of course, a plan to have a lifestyle practice that lasts as long as the advisor is able to maintain it still raises two key questions: 1) does that mean that any remaining value to the practice will be lost when the advisor finally winds down (especially if it happens abruptly due to death or disability); and 2) what happens to the clients and their advice needs when the advisor finally (and potentially abruptly) departs? Implicit in the discussion of our industry’s ongoing “succession planning crisis” is that succession planning is the only solution for advisors to avoid both a financial loss for the value of the practice and a potential disruptive risk to clients. Yet if ultimately, the true problem is just ensuring some kind of “exit” value for the practice and providing continuity for clients, perhaps it’s really time to talk about exit planning and continuity planning as such. The idea of exit planning is to provide for a means harvesting some terminal value for the practice at the time of the advisor’s retirement/death/disability, recognizing that it may be less than a “full” sale would be worth at an earlier point (though still worth far more when you count the cash flow being drawn from the practice along the way!) but that the practice is not necessarily “worthless” even if the advisor is (abruptly) gone. The structure of the arrangement might look very much like a “typical” buy-sell agreement for a practice, with a valuation formula based on the clients who actually transition, and executed with a buyer large enough to be able to take over the practice when the time comes (unlike many buy-sell agreements that small advisory firms sign with each other, where the reality is that neither would have the capacity to take the clients of the other if something actually happened!). And such arrangements are not just a fantasy; Focus Financial recently launched an exit planning option for “smaller” advisory firms to be acquired by Focus firms when the time for transition times, and in point of fact our own Pinnacle Advisor Solutions program has been offering an exit planning agreement for several years. In this context, continuity planning dovetails directly with exit planning. Continuity planning is about ensuring that if something happens to the advisor, clients still have an(other) advisor to call for their advice needs, their portfolio is still being monitored and managed (presuming the advisor has discretionary assets under management in the first place), and someone is still available to facilitate account servicing requests. In some cases, the continuity plan may simply be the exit plan, though ideally the advisor seeking to implement a continuity plan should have some level of deeper integration to facilitate the transition, so the advisor(y firm) taking over actually has an effective means to facilitate the continuity for clients. For instance, the advisor might “tuck-in” to the acquiring firm at an earlier stage – maintaining control of the practice but utilizing the larger advisory firm’s tools, technology, and systems, so it’s easier to take over in the event of a problem. Alternatively, the advisor could outsource to a third-party platform that has investment discretion that is already willing to be a buyer for the exit plan, so the investment management services for clients can continue smoothly during the transition process as a new advisor is put in place. In point of fact, proper planning for exit and continuity planning may soon no longer be a choice; state investment adviser regulators are beginning to consider whether some form of business continuity and succession/exit plan should be required of investment advisers to ensure there are minimal disruptions for clients. If this rule comes to pass, expect to see a dramatic uptick in providers of exit and continuity planning, as it’s still not clear that many advisors will want to implement a Grau-style full scale internal succession plan, but all advisors may ‘be required to have a plan to ensure continuity for clients (and it wouldn’t hurt to get paid something with a buy-sell plan upon exit, too!). Though even without the requirement, an increasing number of advisors seem to be opting in this direction anyway, if only to better improve their client retention or their ability to continue to grow the business when new retiring clients reasonably “fear” that they could legitimately outlive their advisor and find themselves in search of a new advisor in their later years when it may be harder to find one. But bottom line is simply this: succession planning may be quite unnatural for entrepreneurs, undesirable for those who find fulfillment from their professional vocation, unnecessary for those who have a continuity plan, and a third-party sale (and even some succession plans) may provide far less dollars than simply sticking around and drawing cash flow from the practice and then selling whatever is left over at the end. So perhaps it’s time to stop criticizing what as many as 99% of advisors are already clearly demonstrating they don’t want to do succession planning and leave their practices before they are financially and personally ready to do so, and focus instead on how to help advisors redesign towards the kind of lifestyle wind-down practices they do want, with better support for exit and continuity planning instead?